For more than three decades, the Near East Foundation has touched the lives of millions of disadvantaged people in the African nation of Sudan. As one of the few continuously operating international NGOs in the country, our projects are improving lives and communities through education, peace-building, business development, agriculture and natural resource management, climate adaptation, and health care. Building Peace through Economic Cooperation by providing those affected by war – including Internally Displaced Persons (IDPs) and ex-combatants – with training in business, natural resource, and conflict management skills that enable them to rebuild their communities economically and socially. Improving Natural Resource Management and Environmental Sustainability through our work with communities in Darfur and gum arabic producers in North Kordofan, NEF helps individuals to adopt efficient techniques that improve the quantity and quality of their harvest, and protect and preserve natural resources. NEF’s Sudan headquarters is in Khartoum, with field offices in Zalingei (Central Darfur) and Dilling (South Kordofan) and presence in El Obeid (North Kordofan). Between July of 2016 and January of 2018, NEF and its partners have, mobilized and formed Water and Sanitation Committees in seven village clusters, providing trainings in hygiene and sanitation to 150 members. Trainings have been disseminated to more than 3,500 individuals in targeted communities. Further, 128 village hygiene cleanup campaigns conducted in South Kordofan and 38 in Darfur. NEF has distributed 2,000 hygiene kits to beneficiaries, trained 116 artisans on constructing concrete latrine slabs, and distributed 200 sets of tools for digging latrines. Over 1000 latrine slabs have been constructed for beneficiaries. More than 450 households in Central Darfur and 130 in South Kordofan constructed their own latrines using locally available materials (wooden poles, grass mats, and nails, as well as digging the pit) after participating in trainings. 136 people have been trained in hand pump mechanics (including 38 women) to maintain and repair hand pumps and 29 hand pump repair kits were distributed to enable the trained mechanics to maintain the rehabilitated hand pumps. The project has rehabilitated 78 broken hand pumps, installed 19 new pumps, and rehabilitated 4 hand dug wells benefiting over 32,000 individuals. NEF and its partners will strengthen the contributions of 10 Civil Society Organizations (CSOs) in eight cluster of communities as partners and stakeholders in support of inclusive, peaceful and sustainable economic and social development in rural Central Darfur, Sudan. This project is implemented with the financial assistance of the European Union. Increase the technical and management capacity of CSOs to improve access to collaborative and quality Natural Resource Management (NRM) and Water, Sanitation and Hygiene (WASH) and for vulnerable communities and create positive change in the lives of communities living in 8 clusters of 46 villages in four Localities through 16 multi-actor and CSO-led collaborative NRM and WASH community interventions. Further, strengthen the effectiveness of CSOs in cooperating with other actors to assess, prioritize, communicate, and coordinate local needs of vulnerable groups related to WASH and NRM. NEF will increase the sustainable income, leadership and inclusion of vulnerable women involved in the non-wood forest products sector (i.e., Gum Arabic, B. aegyptiaca, Z. spina-christi, T. indica, A. digitata, and forest honey) in 9 villages in South and North Kordofan (Sudan) through association building, improved market inclusion, entrepreneurship training, and collaborative natural resource management. Increase the income of 2,242 women by 40-100% and asset accumulation by 10%, reverse local forest degradation by 6% annually, form and build the capacity of three cluster-level producer organizations, incubate 36 high-growth women-run enterprises, and initiate 21 collaborative natural resource management projects that benefit multiple groups. 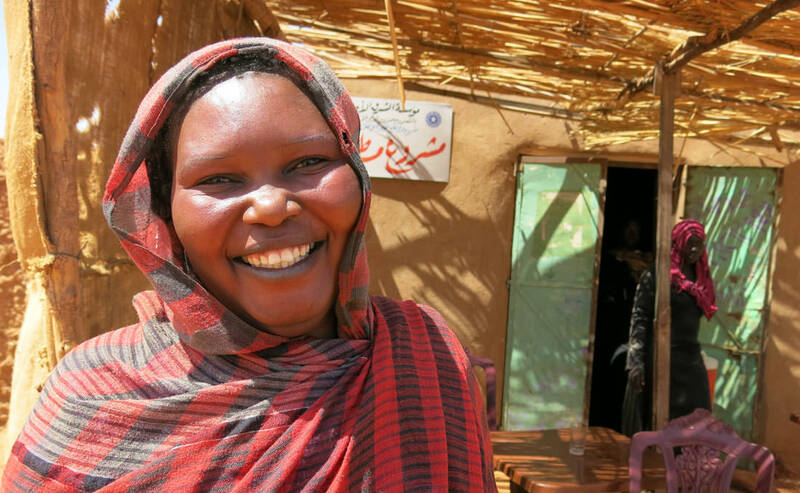 Construct two women’s center that will give women a place to create livelihood activities and promote peace among in the Azoum locality of Central Darfur. The construction of Women’s Development Center in Sulu village and Orokom village along with livelihood and peacebuilding activities. Brick making training conducted in parallel with construction of centers. The project builds on NEF’s success in peacebuilding through collaborative natural resource management and livelihoods support in Central Darfur State. NEF is helping reduce tensions between competing natural resource user groups through targeted collaborative natural resource management projects, including (1) rehabilitation of community watering sources (water harvesting), (2) demarcation of animal migration corridors, and (3) enrichment of 10-hectare pastures areas along corridors in two localities. Key accomplishments of this project include: Forming two pasture committees and started enrichment planting on seven hectares in Abata areas; pasture seeds broadcast along 182km of demarcated grazing corridor; 226 edge markers constructed for grazing corridor and constructing two wells in Darlow and Kidibu villages underway, training underway for members for water committees. Dar Al-Salaam Al Rabwa is a settlement of 40,000+ internally-displaced people living about 40 kilometers outside Khartoum. Its inhabitants have little or no access to potable water, education, electricity, or healthcare. In 2002, NEF built the community’s first health clinic, providing a range of such basic health services. In 2006, a generous donation from the Population Council enabled NEF to add a delivery room and reproductive health services unit, including obstetrics, pre- and post-natal care, and family planning. The clinic grew steadily for many years, adding an HIV educational program to increase local awareness of HIV/AIDS; distribute information about transmission and prevention; and improve the quality of life for HIV/AIDS sufferers in the area. By spring 2010, the clinic was serving more than 2,000 patients a month. That same year, NEF turned management of the healthcare facility over to Umm al-Momenein—a Khartoum-based NGO that focuses on primary health care—thus ensuring the clinic’s continued stability and local ownership. NEF continues to support HIV/AIDS awareness in the community, in collaboration with clinic staff. NEF staff helped 22 new women participants start small businesses and continued to mentor and monitor 55 previously established women-owned enterprises. Sudan exports roughly 50 percent of the world supply of gum arabic, providing a source of income for one in five Sudanese—about 6 million people. This natural forest resource is used widely as a stabilizer in products ranging from soft drinks to pharmaceuticals. But drought, desertification, civil war, and poverty are challenging Sudanese farmers and their ability to harvest gum arabic from the acacia trees that grow naturally in the region’s harsh climate. For impoverished families, the project is improving their incomes and quality of life, bringing hope to rural areas of North Kordofan. This pilot project helped farmers break the poverty cycle, conserve natural water and forest resources, and fight climate change in Sudan’s “Gum Belt.” NEF trained farmers in the latest techniques to increase gum arabic production and promote long-term sustainability, while newly-established microfinancing systems helped farmers and their families undertake projects that support both improved production and conservation. 83 income generating activities increased beneficiary’s income by 350%. In Sudan— a country ravaged by 25 years of civil war—NEF supports the peace process by providing the tools and skills hundreds of Sudanese soldiers need to become financially independent after war. To help ex-combatants integrate into civil society— both economically and socially— into their communities, NEF is providing them with training business skills and conflict management. Once they have completed the training, NEF offers ex-combatants microcredit loans, in-kind grants, and ongoing business coaching to help them start their own small businesses.